The exclusive incubator for start-ups led by women entrepreneurs WE-Hub was officially inaugurated on Thursday by IT Minister KT Rama Rao. HYDERABAD: The exclusive incubator for start-ups led by women entrepreneurs WE-Hub was officially inaugurated on Thursday by IT Minister KT Rama Rao. The incubator will start functioning from Friday and will be located in a temporary campus at Dr BR Ambedkar Open University(BRAOU) in Jubilee Hills. The establishment of WE-Hub by Telangana government was announced by IT Minister KT Rama Rao on the last day of Global Entrepreneurship Summit (GES) in November last year. WE-Hub will start accepting applications from aspiring women entrepreneurs starting Friday and the window will be open for six-and-half weeks. Applications can be sent through the WE-Hub website. The incubator will have capacity to house 100 start-ups and will soon shift to a permanent campus that is presently under construction in Madhapur, in phase-II of T-Hub incubator. 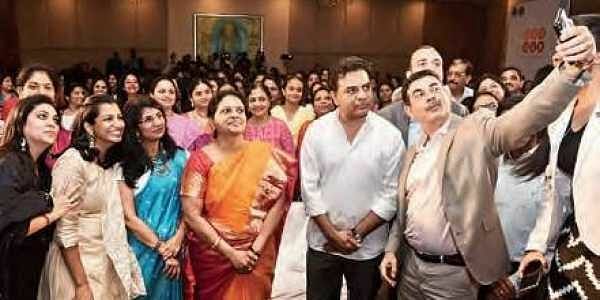 Speaking at the event, KT Rama Rao said the incubator would be open for women entrepreneurs across sectors and not restricted to just technology-related fields. At the event, MoUs were signed between WE-Hub and the cloud computing major Salesforce, technology business incubator Association for Innovation Development of Entrepreneurship in Agriculture (a-IDEA) located at NAARM, IIM-Bangalore based incubator NS Raghavan Centre for Entrepreneurial Learning (NSRCEL) and PricewaterhouseCoopers (PwC). Also MoUs were exchanged between Government of Telangana and United Nations Development Project (UNDP) and CII-Indian Women Network. UNDP will help bring international best practices and international contacts for start-ups in WE-Hub focusing on social entrepreneurship. IT Secretary Jayesh Ranjan said in two months time startups will start functioning at WE-Hub. He also said that WE-Hub will be the first state-run incubator to partner with the Women Entrepreneurship Platform of NITI Ayog. KTR said that WE-Hub will work in coordination with 35 other incubators functioning in Hyderabad. He also informed that `15 crore has been exclusively allotted for WE-Hub and that the state government will allocate `25 lakh to `1 crore seed money for the selected startups. As part of International Women’s Day celebrations and for their convenience, GHMC has opened three She Toilets for women on Thursday. The places where She Toilets were opened include near KBR Park, Golconda Fort, near Tarnaka bus stop. Out of the proposed 44 She Toilets under CSR, 27 have been completed. An open land, which was once used for dumping seized vehicles at old Saifabad police station in Lakdikapul, has been transformed into a rose garden. The garden has been developed at an estimated cost of `30 lakh. The garden was opened by GHMC mayor Bonthu Rammohan on Thursday. The entire area has been beautified with different seasonal flowers.